Most people have been looking at Jerome Powell’s Chairmanship of the Federal Reserve as continuity, a comprehensive extension of Janet Yellen’s (and therefore Bernanke’s). This would by nature include all the nasty habits Chairman Yellen had picked up during her one term. At the top of that list is the word “transitory”, particularly how it came to be used during her tenure in a manner wholly inconsistent with its meaning. This expression she applied mostly to inflation, or as if somehow a valid excuse for the central bank missing its inflation target (mandate) for the last half of Bernanke’s second term as well as the entirety of her own. Six years cannot fall inside the definition of transitory. But when you have no other alternate theory? At his Humphrey-Hawkins mandated testimony last month, Jerome Powell briefly mentioned the other undershoot. This one happens to be the very factor that policymakers are counting on for transitory to end. Alongside a great many economic problems, worker wage rates have remained stagnant in nominal terms, and atrocious in real terms even with low calculated inflation. Powell, however, is upbeat (when is he not?) Wages, he told Congress, “should increase at a faster pace as well,” for one because inflation has been “as likely reflecting transitory influences that we do not expect will repeat.’’ Weak wages are transitory, too? That’s some continuity Yellen to Powell, as was the acknowledgement of productivity problems. Holding back the American workforce is the lack of investment on the so-called supply side (capex). To that end, linking low productivity growth to this continued weak wage environment, the new Chairman was encouraged by the recent tax law changes which he believes “should support higher productivity growth in time.” In other words, transitory there, too. And yet, there isn’t one sign any of that is true. There is instead every bit of evidence suggesting, strongly, nothing has changed. If you want to believe that the last tax bill will be the reason all these factors will suddenly turn positive, then you first have to explain why the last two or three failed to do exactly that (and the ARRA included far more purported incentives and benefits, and companies refused the invitations anyway). The BLS reports today on productivity estimates in conjunction with the BEA. Productivity is the difference between the labor side of the economy and the capital side where the mix between the two (capitalism) is the miracle of economic growth (Adam Smith’s invisible hand). The data in this part does demonstrate Powell’s frustration. US productivity growth has been stuck at the worst levels of the post-WWII period. In immediate terms, that goes back to 2011 in the aftermath of the 2012 slowdown. But even before then, productivity had only increased in 2008 and 2009 as a result of massive workforce reductions (layoffs), the kind that have become permanent over time. For the past almost 12 years (since the housing bubble burst) productivity has been unusually weak. During the 1990’s following the 1990-91 recession, economic output was the typical combination of capital and labor. A little more than half of its expansion was derived from the increase in labor utilization, while a little less than half was through increased efficiency of that labor. The result was a steady increase in the economy that extended into the longest post-war expansion. The current “expansion”, the one you see on the right, as lasted nearly as long and is estimated (FWIW) to break the record. Unfortunately, that doesn’t count as a recovery especially when factoring the size of the contraction preceding it. 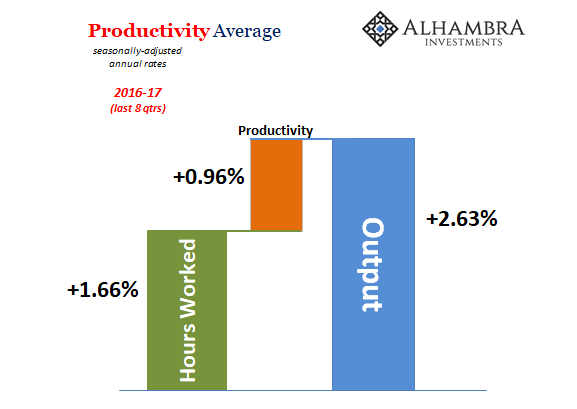 There have been, on average, significantly fewer gains in hours worked (just in the “recovery” portion, again not counting the contraction) and very little productivity. The result is substantially less output, meaning overall the lack of recovery. 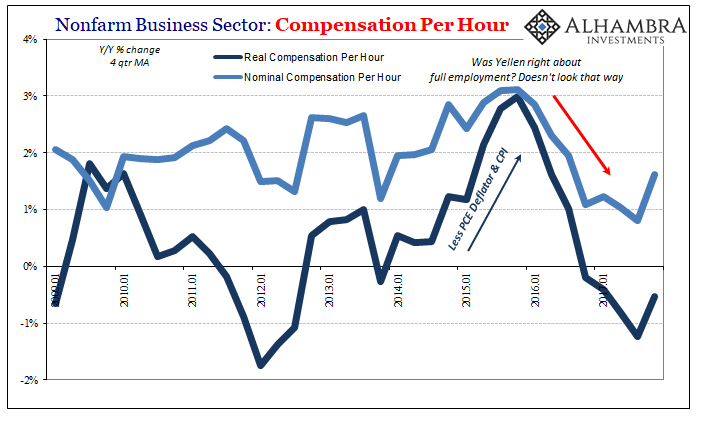 The behavior of the labor market over the past few years is instructive along these lines. 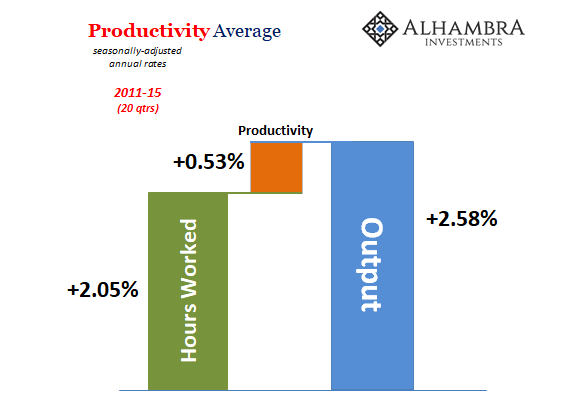 From the start of 2011 through the end of 2015, productivity was less than the average shown above. Output, however, was about the same. That meant more hours gained for labor utilization. 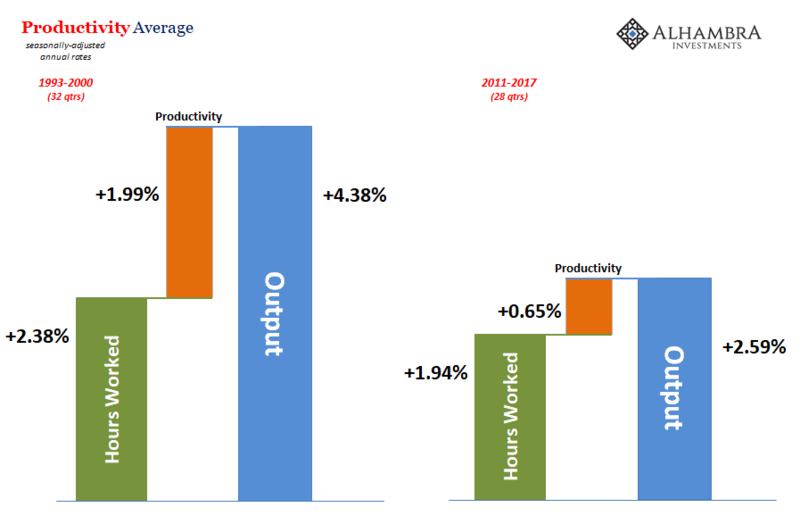 Or, another way of saying it is that these figures show once the 2015-16 downturn hit, businesses reduced their labor utilization (weaker jobs market, including wage and income growth) that necessarily had the effect of raising productivity given that output was largely the same on average. In other words, going back to 2004, the only way American businesses seem able to gain in labor productivity is to cut back on labor growth at the margins. There is nothing good or positive about these results. It speaks to the lack of profit growth, and how businesses are forced to operate in this prolonged stagnation. To claim that is about to change for reasons that can’t be specified, other than the use and derivation of the word “transitory”, is utterly absurd. Jerome Powell, as Janet Yellen, refuses to ever use the word buybacks, but trillions of dollars are used regularly to repurchase shares that can’t then be used to add to productive capacity. U.S. companies are buying back their shares at an aggressive pace, stirring questions in Washington and on Wall Street about the way that the new corporate tax cuts are being used. There are a good many other problems indicated by these productivity estimates, too. I’ve been writing for years that the continued imbalance against productivity gains could be as much statistical as a real problem. 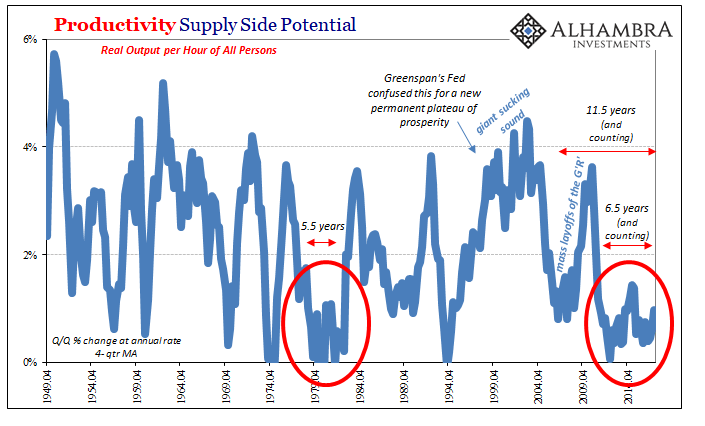 This isn’t mutually exclusive with what I’ve written above; share repurchases very likely are constraining supply side expansion but perhaps not to this extreme extent.